All I expected was edutainment. That’s what they call it, don’t they? The type of software trying to make the link between what I enjoy doing (playing video games) and what people think I should be doing with my free time instead (learning something). Memories of Oregon Trail and Typing of the Dead wafted into the room while I sat through the almost-obligatory hard-drive installation that PS3 games are known for. Hakuna Matata is the game most people know as Afrika, but was re-named for the Chinese territory, along with a much desired option to play the game in English. When I decided to import it, I planned for a fun distraction that would impart the tiniest amount of knowledge possible about the subject matter, similar to a tour at the local zoo. I was ready for it. Before I knew it, I was holding on tight to the back of a dirty jeep carelessly careening across a plain that stretched far across the horizon. The sunlight bleeding over the lush vegetation was invigorating. The addition of an upbeat orchestral score perfected the feeling of being part of a real-life safari adventure. I began my high-risk/high-reward balancing task, trying to get close enough to get good pictures but keep enough distance to not be noticed. The driver slowed down as we reached a small pond. He tried to suggest some advice, but I was too excited to pay attention to what he had to say. I climbed my way out of the jeep and slowly made the rest of the trip on foot. I saw a zebra hanging around the other side of the pond and realized that it might be my chance. A bottled water company was desperate for a good high quality picture, but in order to satisfy their request, I needed him to be up close and looking towards me. This defiant creature walked in my general direction, at a slightly awkward angle, and sharply turned around when he was almost in view. Then he repeated this pattern another two times. I started to feel like he was fully aware of what I was trying to do, and he was mocking me. At the time, I didn’t even consider that he might have been following an A.I. routine. He was real to me. The zebra turned its head to look at me, but before my flash had a chance to go off, he quickly galloped to the other side of the pond to graze. I would continue to wait, the ambience disturbed by the sound of my teeth grinding. Success in this game requires patience, waiting cautiously for that perfect moment to come around. Conversely, it meant I would be constantly on edge, knowing that perfect moment might come out of the blue. One false move and I could make my target aware of my presence, but sticking to one spot might provoke an aggressive species to defend its territory, putting me in immediate danger. A title like Tom Clancy’s Afrika would be a closer fit for the tension it delivered. When I first received it, the task sounded significantly easier than it actually turned out to be. Time would prove that there was more to this mission then a couple button presses. Some of my initial shots came out too blurry, over focused or I was far away from the source. I already took shots of the zebra, but the camera I started out with didn’t zoom in very closely. I would constantly have the desire to move in closer, but I couldn’t risk the potential of scaring him away. I nearly dismissed this mission as impossible in its current state, assuming that I needed to buy a better camera before I could complete it. I would later realize that it was my own ignorance of the opportunities such a setting could provide that truly hindered my progress. The sun slowly began to disappear and I worried that I might not get my shot in before the end of the day. This wasn’t just an animal; this was my prey, my ultimate goal. I needed to know as much information about this elusive zebra as possible. I stopped and checked the in-game database, which automatically filled with information whenever I discovered a new beast during my excursions. It’s an expected feature for this type of game, to be sure, but one that works much more fluidly than just as a tacked-on encyclopedia for me to ignore. How a wave of euphoria would flow over me when I caught two lion cubs playing in the water so aggressively that a nearby giraffe nearly toppled. I would be there with my camera to catch it -- a simple matter of being at the right place at the right time with my finger on the flash button. How the amount of money I would earn from capturing these rare spontaneous moments would depend on my ability as a photographer, from framing to composition. How that money garnered me new and better equipment, including the ability to record sound, which aided me in completing tasks more creative and complex than I could ever imagine possible. How that online database I’d thought to be a great diversion turned out to also be intelligently integrated into the game. Not only would I learn real facts about an animal’s eating habits, sleeping patterns and behaviours, but I would need to use those facts to effectively complete some of the missions. 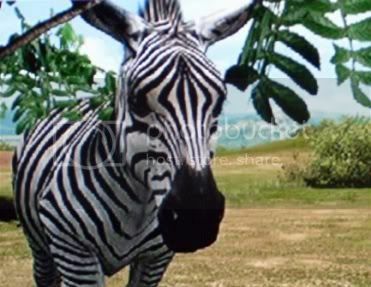 But at that point in time, all I cared about was getting that zebra to look in my direction. I decided to be more tactical, crouching behind a nearby bush. I kept my focus on my target and followed his movements as fluidly as I could. Finally, as if he had grown tired of leading me on, he walked right up to the bush and stared intensely into my lens. This wasn't at all what I was expecting. But, in that instant, the game snapped into focus -- and surpassed my expectations. I find it funny that this article made me think about the purchase of a PS3! The next step here seems to be a National Geographic presents game wherein you shoot and edit a video on wildlife completly in game. Afrika's been a big blip on my radar for quite some time. It's a shame I'd have to import it (and buy a PS3) to be able to experience it, however. Thanks for the writeup; it really sounds as cool as I'd hoped it would be, perhaps even more so! Does anyone know if this is going to be released in North America? It's been rumoured to arrive several times, the latest info suggests National Geographic would be publishing it, but the expected release date for that continously passes by. If not, well, the import from Play-Asia was pretty much identical to in-store costs and region-free if you're curious enough. Success in this game requires patience, waiting cautiously for that perfect moment to come around. Conversely, it meant I would be constantly on edge, knowing that perfect moment might come out of the blue. One false move and I could make my target aware of my presence, but sticking to one spot might provoke an aggressive species to defend its territory, putting me in immediate danger. The sun slowly began to disappear and I worried that I might not get my shot in before the end of the day. This actually sounds pretty damn cool. I'm curious to see this game in action! Maybe at the next S&T we can actually get together and PLAY some games. I didn't realize Afrika was released already. I'm not much on importing, but this always seemed like something I would be interested in . . . mainly because it's so different and I like nothing more than novelty. And the fact that I thought it had such poor chances of making it to out shores. Anyway, after watching video and some screen shots I came to the conclusion that I'd probably be distracted in the game by the possibility that we're still a console generation or two away from realism that doesn't provoke the uncanny valley for me (though, admittedly, animals don't elicit this reaction as much as humanoid creatures). That turned me off. Still, if it comes out here, I'm all over it. Now *this* is what an educational game should be! Awesome to see that somebody gets it. Compelling gameplay that you can lose yourself in? check. Real-world information helps you play better, which provides the context and motivation for actual learning? check. Makes me wish I had a PS3. This game does look intriguing, and very nice write-up kuddles. The PS3 does have some pretty interesting titles available, maybe one day I will actually own one. Nice write up. I've been really looking forward to this game since it was announced, and the announcement of National Geographic's decision to publish in North America was very exciting to me. If it doesn't look like there will be any other way to get a hold of it I might have to import my first game ever. Me too. No word on possible ports to PC/360, eh? Kuddles the link you have to play asia says the games is in chineese/english... is there anypoint in the game where there are language barrier issues? Oh, I dunno, that Zebra seemed pretty mean to me. None at all, everything I've witnessed so far is in English. You don't even need to be concerned about fiddling with the menu the first time through, as the game recognized that English was my language choice on the console from the outset. There's some sort of delightful irony to the fact that you need to import from China to get the English language track of a Japanese game. Oh Sony, what a twisted web you weave. What's the difference between the Chinese version and the Japanese version? Is only the Chinese version ENG compatible? It looks like the JP version is $10 more, too. This is definitely something I'd import and it's totally my type of game. I'd just like as much info as possible before making my move. Lay it on me, people! EDIT: Is anything censored from the Chinese game? Does anyone know? With some more info this is something I'd order by COB today once I get sprung from this meeting. Kuddles, if I enjoy Endless Ocean would you say this is a safe buy for me in your opinion? What would hold you back from recommending this to someone who knows this is a very alternative gaming experience going in? Have you played Wild Earth, and how does Afrika compare? I've been debating whether to pick this title up at the videogame store that sells imports near my apartment. This article has only made this decision a wee bit harder than before. "A pirate I was meant to be, trim the sails and roam the sea!" How so? I'd like to hear more about your internal struggle and the reservations you have. It sounds interesting. From what little extra info I dug up after reading this it looks like National Geographic wants to rename it for the North American version. Personally I think a game with the words " National Geographic" before it might scare people off. As a business they should keep the name "Africa" or maybe even "Hakuna Matata." I for some reason feel these type of games get over looked because their named badly. "Safari Photo Africa Wild Earth" just makes me want to pass it up without giving it a second look. Why? The word Photo puts you off since in the past Photo games were not the most entertaining. Any connection made to something educational like National Geographic is like a natural turn off in our mind unless we are into it. So in a way I feel the game she keep the name Africa. Anything more would just bring down the sells of what could be the most educational game of the year. P.S. I would love and Xbox 360/PC version, but I feel the PS3 needs some good titles. Their pantry is bare right now. I would say this game would certainly be up your alley. It'll just make you wish that there was an HD version of Endless Ocean. The translation is actually pretty decent. I think the only thing holding anyone back would be curiosity if the American version comes out. It's too early to know if the new publisher might make changes to the game for an American audience, and whether one feels those changes are for the better or for the worse. Sorry, Itsatrap, other than Endless Ocean, this is the first game of it's type I ever tried so I can't really compare it to anything else. Cabela license and a rifle. I'm ordering it now. w00t! Gonna poke a rhino! Is there a level where a warthog and a meerkat dance together? If not, then I'm not interested. That's no version of Africa I want to visit. It'll just make you wish that there was an HD version of Endless Ocean. You mean like the ps3 version of Aquanaut's Holiday? I've heard good things.... It's supposed to have some strange Eastern story though. Well, Hakuna's backordered but I put in for my copy anyway. Looking forward to checking it out. Thanks for the reminder that this game existed, Kuddles. I had started to think I'd never see it (like GT5). But is it or is it not a passing craze? As an amature photographer this sounds really cool. Hope they bring to N.A. or I may have to import a copy. Same here. Seriously considering the import. I have to admit, this look very intriguing. I was thinking a meetup at my place for the next one.